When Will God Save Mankind? ...home there is sickness. In almost every mind there is fear and worry, and we're having our struggles and our problems and our troubles. Almost every life is empty and we try to invent every idea of a pastime, or a pleasure, just to crowd out our own emptiness and feeling of unhappiness, and all that sort of thing, and pass the time away. In other words, as I think I said the other day, we seem to be trying to while away the time until death finally catches up with us. As if we're trying to get it over with, and get this life over with as quickly as we can. And then on the other hand, there is this thing we call the instinct of self-preservation, whatever that is, but it certainly is something that's in everyone of us. If anybody thinks he's going to die or be killed, he'll do anything in the world to prevent it. We seem to want to go on living. And yet we try to find some kind of a pastime to while away the time and get it over with. Why don't we wake up? Why don't we stop to think of these things and look at them as they are? Then in the world we have nothing but chaos, war, and fear of war, and threat of war, and preparation for World War III. Now, again, we need not have these things. I've said, "Why does God permit these things?" And I've been saying that, of course, God could stop it. God is able to stop it. We say, "Is God a compassionate, loving God? Does He love us?" Surely. Does He love us enough to want us to suffer? Well, He doesn't want us to suffer. Then if God doesn't want us to suffer, and if He has all power, why doesn't He prevent it? And once again, let me tell you, my friends, God Almighty has a purpose He is working out here below. And God could prevent all human suffering. It certainly would defeat His purpose. The only way that God could prevent human suffering would be to force you and me, to live the way that would prevent suffering. Now, all suffering is coming on us because we're bringing it on ourselves. Because the way we think, the way we act, the way we live is not the way of peace. It's not the way of health, it's not the way of happiness, and joy and prosperity. But the way we think, and the way we act, and the way we believe, and the customs we follow, and way we live is the way of strife. And of war, and of sickness, and disease, and of fear, and of worry, and the way of empty lives, and everything we're bringing on ourselves. Now, we're reaping just what we're sowing. And the only way that God could prevent it would be to cram His religion down our throats, because His religion is merely, His way, which is the way to peace, and to prosperity, to happiness, to full abundant living, and everything good and worthwhile. But men don't like that way, and they don't want it and they have resisted it from the time of Adam on to now. Now, it's true that God has mapped out a seven thousand year period. And at the end of the first six thousand years — during which God has kept hands off, during which God has not interfered, during which God has not used any force on any man, to force any man to live as he ought to live — but has permitted every man to live just the way he wants. God has made His truth available. Man is able to learn, and to find out, if he will seek it hard enough, and want it badly enough. If he hungers and thirsts for righteousness, if he wants it he can find it, it's available. God has always made it available. No man has any excuse. Any man could have found the right way. But God has not forced us to live that way. He has not forced anything upon us, He's used no force whatsoever. He has made it a matter of free volition, an independent decision on your part and mine, otherwise God's whole purpose would be defeated. Just that full as you read in eleventh chapter of Isaiah. Well, that's where we are. Now, Jesus came preaching this truth over nineteen hundred years ago, and men seem to have rejected it. They have remembered about Jesus. They extol Jesus. They tell people all about Jesus. But they don't tell people what Jesus' message was. They claim to talk about the gospel of the Kingdom of God, but they don't know what the Kingdom is. They talk about being 'born again' but they don't know what it is to be born again! Listen, Jesus is one who was born again. Did you know that? Now, during Jesus' lifetime He was not born again. He was born a Son of God as well as a son of man. That's the way He was born. He had been begotten of God, and in that sense He is the only one that ever was begotten of God. And in that sense He was the only begotten son of God. But listen, Jesus had only been born of the flesh. Begotten of God, but born of the flesh, born of the virgin Mary. And He was God incarnate in the human flesh. And so, He was made flesh, He was God changed into man, yes. And He had been born, and He was a man, and He " was [tempted in all points] like as we are..." (Hebrews 4:15) But He had not then been born again. Now, then, do you realize that the Bible says that "...he [was]...the firstborn among many brethren" (Romans 8:29)? Now, in what manner was He the firstborn of many brethren? It's speaking of His resurrection. By a resurrection He was born again. And the first to be born again of many brethren by a resurrection. The only way that anyone ever did, or ever can be born again is by a resurrection! And so far that has occurred to only one human being, who is the firstborn of many brethren. I hope that you will be one of those brethren because we all can be. Now, we can be begotten now, not quite in the same manner Jesus was. Not being begotten by a flesh birth through the Holy Spirit as Jesus was. But we can receive the Holy Spirit, and be begotten by the Holy Spirit, after we've been born this first time, and we have that begettal. We have the Spirit of God, the very life-germ of God, the very nature of God transplanted into us and within us. You hear a lot of psychology, and whacky, warped psychology in these days about cultivating the God that's inside of you. They say that God is just this something that's inside of you. That you've never quite cultivated the hidden resources inside of you, and all that sort of thing. Now listen, the plain truth is that the average man is not using one tenth of his mind power. And that there are dormant qualities, and abilities, and talents lying more or less dead in nearly all people. That part of it's true, the psychologists are right that far. But the real great power — that is God — is an external power. And the thing is you can come to God, you can find God, and you can receive the power, the Spirit of God, which is an essence. And which is the power, the love, and which is the understanding. And the power of God, and the faith of God, and the patience of God. And all the nature, and the character of God, and that can come into you. But that is something external that comes into you from without. That's something you were not born with. And that's something that, if you don't receive it, and if you don't conform to the terms and conditions, so that you can receive the Holy Spirit during this life, you will never be born again. But you're not born again when that happens. My friends, if you're born again, you cannot sin. I mentioned that a few days ago on this program, that a person who is born again cannot sin. And a good many people noticed that over here in first John and it's bothered them, it's troubled them. Did you know that? Now, a lot of people who have been taught that you're born again right now, the minute you say you receive Christ, you accept, you appropriate, you take, you get, you appropriate Christ. That's the kind of language we hear in this day. Jesus Christ taught giving. He taught giving your life to Him, not taking His life to you. Of course we receive His life, alright, when we give our life to Him, that's true. But we'd better start on the giving end, and give our life to Him. And then He'll give His life to us and, oh, how wonderful that is. But listen, do you know anyone like that — that is more righteous that Jesus Christ was while He was here on the earth? He didn't sin, that's true. And you do, and that's the difference. No, He didn't sin. But that doesn't say, and there's nothing in the Bible that says, that He could not have sinned. He certainly could have. If He couldn't sin, He couldn't have been tempted. How can you tempt a man that can't sin? Now, can you tempt God? Do you think God ever now, suffers a temptation to do wrong, till He just can hardly resist, and has a struggle with Himself to keep from doing wrong? Is that the kind of a God you picture? Let me tell you, I don't find any such God revealed in the Bible. The God I find revealed in the Bible is a God that has no temptation whatsoever to sin. But Jesus was transformed into human flesh, like you and me. So that He could know what we have to suffer, and the trials, and the problems we have and He was tempted. And being tempted, He could have sinned, He merely didn't. And the reason He didn't is He was closer to God than you and I. He kept Himself further away from the world. He spent more time in prayer. He was in closer communion, and closer contact with God the Father than you are. That's why you sin, and why He didn't. He had more time to spend with God. Well, we're living in a different world today, and even if we wanted to, I doubt very much if we would be able, in this kind of world to live quite like that. I don't know whether we could. I know that we get so busy in this complex world, this mechanical complex world that we live in today. And so many duties and we're going at such a fast clip today. They didn't go at quite that fast a clip. I don't know whether we could, in this kind of a work-a-day world, that we live in today, find as much time for prayer and for communion with God as Jesus did have. And still we ought to. Because this mortality will put on immortality. Yes — in a moment, in the twinkling of an eye, then we too will be no longer of the human family, we will be of the God family. Oh, I wonder if you realize that? You know, my friends, they say that we're of the animal kingdom now. They try to teach that we evolved from lower animals by evolution. They try to give us a tie up, and a connection with animals through evolution. And they're looking for the missing link to tie us to the animal world and the animal kingdom. Now, I heard a minister say something. I'm not of his church or his religion at all. But he said something that was very good, and perhaps you heard it. It was on television. And this man said that the real missing link is Jesus Christ. But He's the missing link between the human and the divine family. I don't think he quite comprehended it all. God did form the human group in His image. And we consider we're in the animal kingdom because of the flesh, we have the same life as animals. Like animals — we're like animals in every way.- except that man has a human mind, and he's in the form and the shape of God. And man has the possibility of receiving the Spirit of God, the impregnation of God, and becoming born again — next time born of God. And no animal can do it. An animal lives, an animal dies, and that's the end. He isn't going to be resurrected, there's nothing further for the regular animal. Now, there's no missing link between an animal and a man. But an animal receives its life from the breath of air, and the circulation of blood, and through the food it eats, and the water it drinks. And so does a human being. Now, in that manner we are of the animal kingdom. We have the same kind of life now that an animal does. But we have a little bit of the God powers of mind that no animal has. We can think, and plan, and reason, and make our decisions. And decide what to do, by reasoning out from a lot of facts. And no animal can do that. Any animal that could even approach it, might do a little bit of that in the most elementary manner, but it's a ridiculously elementary manner compared to the human powers that God has endowed us with. But there is a connection between man and God. And Jesus Christ is that connecting link to connect us with God, so that we can become born of God. And we will be in the Kingdom of God, because God is a kingdom. Now we're in the animal kingdom, but we can be transferred into the God Kingdom, the Kingdom of God. God help us to wake up and to realize it. Well, now, Jesus came preaching the gospel of the Kingdom of God. And He showed that we don't have to be sick, and we don't have to have fears, and worries. He taught faith. He showed us the way out of all of our fears and worries. He showed that you can't find the solution to your problems through men. And He said; "Put not your trust in men, nor the princes of men in whom there is no help." (Psalm 146:3 paraphrased) Yes, He said that, He inspired that. It's written in the Old Testament, but He's the author of it. How many of you have been in that same boat? How many of you have been sick and you've gone to doctors. You go to one, and then you go to another, and another, and you don't get better. They don't seem to know what's wrong, they don't seem to be able to help you, and you have grown worse. Now, in the first place, I want to tell you this; I think that any really competent, and honest physician will tell you that a doctor can't heal. A doctor's drugs and medicines can't heal. And the real competent doctors don't even claim to heal at all. They will tell you that they're merely working with nature and so on. There is no healing but a healing from God, nothing else would be healing. Healing is suspending the penalty you're paying. Now, all in the world that a doctor can do, is to use drugs that are based on the study of chemistry. For instance, you have a certain poison in your body and they administer an opposite poison, that will neutralize the one you have. And the idea is that they prevent the poison from continuing to violate nature's laws any further. And when they stop the violation, they stop the penalty of that violation. Now, the sickness, or the suffering, and the pain that you are experiencing is merely the penalty of violated physical law. That's all it is. Well, if you can stop the violation, if you can stop that which is breaking the laws of nature, why you arrest the penalty. You have to go on pay whatever penalty has already been incurred, and then that's all. But in many cases the violation is continuing through a germ, or through a disease or something of that sort. Now, as a matter of fact when you get into sickness and disease, it's either a poison or a toxic condition. Which is the presence of something that does not belong there, or else it is just the opposite, it is a malnutrition. And when we come into drugs — I'm not a druggist and I'm certainly not an MD, but I know this much about it — just in a simple layman's language, that drugs and medicines are either of an alkaline, or an acid nature. But, of course, there're many different kinds of alkaline drugs, and many different kinds of acid drugs. But if the trouble with you is of an acid nature, they will administer something that is alkaline to counteract it. Because alkali will counteract and neutralize acid, and so it goes. But that, as I have said, is not healing and very often the trouble is something that a doctor or a physician cannot arrest. He can't stop it, he doesn't know even what it is. And some of our most serious things, the doctors are still experimenting. They don't know the cause of cancer. They don't know the actual cause of many things today, and consequently they don't know the one proper and sure cure. In fact, there's only one real cure, and that is that from God. And so on, James 5:14-15. Now, many people have obeyed that command of God and many have come to me. And there are a number who have had cancer — incurable cancer — the doctor's could do nothing. But when I have asked God, and they have merely come to me as God had commanded, and I've merely prayed as God said. That's all, we're merely instruments, I have no power to heal anybody. But they believed God, and He had made a promise. And I tell you that there are people that have been completely healed, and of other absolutely incurable diseases. Now, that's healing. A doctor can't heal — God can. I can't heal, no preacher, no minister can heal. And if anyone tells you he can, well he's either deceived, or deceiving you. One or the other. But God certainly can heal, and Jesus Christ did, and Jesus Christ is the same today as He was then (Hebrews 13:8). But you know she really believed. She really knew. She believed so much that she was certain — she knew. 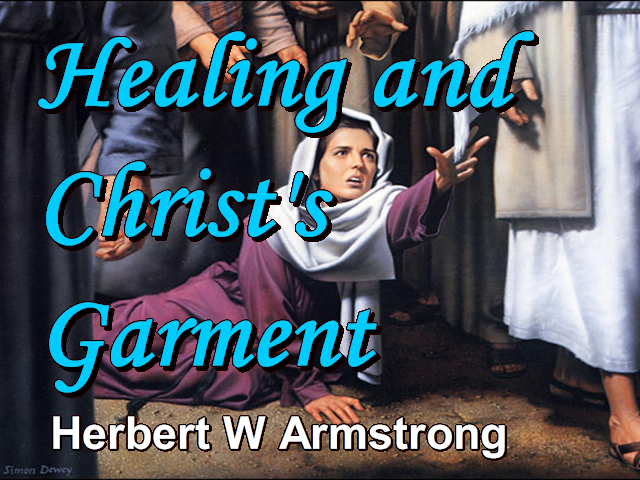 If she could only get up there, and she thought if she could only touch the hem of His garment, the power of God will come into my body and heal me of this, which no doctor and physician could do. Why, here were people jostling all about Him, bumping Him here and there, and they were crowding into Him. And you say, "Who touched me?" Why, there had been — in other words, "Dozens of people have been touching you!" My friends, I have many requests to follow the command of James the fifth chapter, the fourteenth and fifteenth verses. I don't know how many, but often they run more than a hundred a week. And where we can't go out and visit people, which I just can't do in very many cases. This work has grown so great, that my time won't allow it. It's just totally impossible. The same was true of the apostle Paul. And so just as you read in the nineteenth chapter of Acts, the apostle Paul sent pieces of cloth over which he had prayed and which he had anointed. It was merely like a proxy. And he sent it. And when the piece of cloth was laid on them it was just the same as if Paul had been there and anointed them, and laid his hands on them. And they were healed and so we do that. She believed, and some who write in... I'm merely a minister of Jesus Christ. I'm His servant. I'm one He called, He chose me, I didn't choose Him. I didn't want to be a minister, but He called me and made me His minister, and I'm merely obeying Him. But when I do that, if you believe, and many have been healed of almost every incurable disease that you can think of. Oh, I see my time is up. Listen. Write in for our booklet, 'The United States and the British Commonwealth in Prophecy'  and the nations of northwest Europe included in that. There's no charge whatsoever. And so, now, this is Herbert W Armstrong saying, "Goodbye friends."